National Science Day is used to celebrate every year in India on the 28th February in order to provide the Respect to the Raman Effect by the Indian physicist. National Science Day Pledge in Telugu, Raman Effect Video Download here. Sir Chandra Sekhara Venkata Raman, Dr. Chandrashekara Venkata Raman was provided with many awards and also honored by getting Nobel Prize in the Subject of Physics in 1930. His discovery of the Raman Effect helped him win the Nobel Prize in 1930. The day remembers the remarkable contribution of the man towards the world of Science. Thus this day holds a great significance in the world scientific forum and is way to recognize his work in the field science. 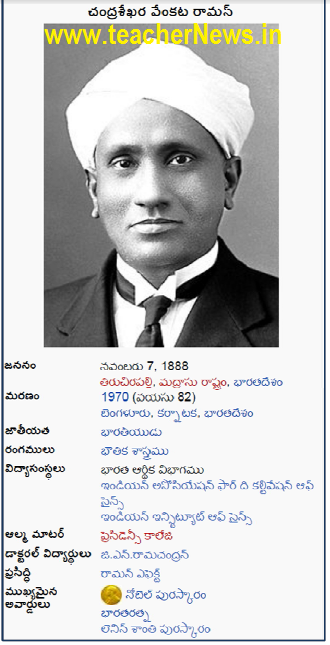 National Science Day is celebrated with great enthusiasm on 28 February to commemorate the discovery of Raman Effect on the same day in 1928 by Indian physicist and Nobel Laureate Sir Chandrasekhara Venkata Raman in India. There are many kind of Technologies developed in India to get the people of India to move ahead in life and get a better life by developing various types of Technologies. It is very important that people should come across the developmental activities and try to focus on developing many things in future for future growth of the Nation. National Science Day celebration in School Level Program on 28th, February 2018 ‘Raman Effect’ in Telugu, Videos, Pledge, Science Projects Download. Good information about science and technology.